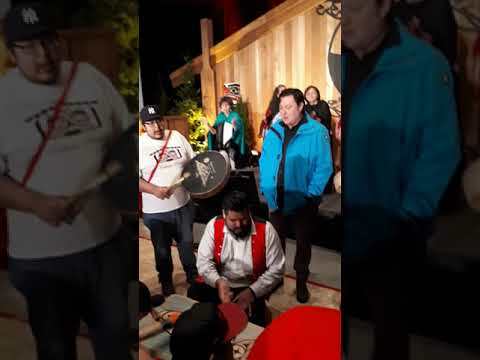 In March the prime minister issued a statement of exoneration for six Tsilhqot’in chiefs who were hanged for murder in 1800s, resurfacing hope that the conviction a Hesquiaht chief and another Nuu-chah-nulth man could be formally forgiven as well. On March 26 Justin Trudeau officially recognized the unjust execution of six Tsilhqot’in chiefs in 1864 and 1865. The men were hanged for the killing of a road crew building in Tsilhqot’in territory at the time. The First Nation declared war on the colony after this territorial infringement and the reported capture of Tsilhqot’in women by the road crew. “These chiefs were leaders and warriors of the Tsilhqot’in Nation who acted in accordance with their laws and traditions, and are regarded by their people as heroes,” stated the Prime Minister’s Office. The statement follows a 2014 Supreme Court of Canada decision recognizing the Aboriginal Title of the Tslihqot’in territory. But a painful injustice remains for the descendants of Anayitzachist, a Hesquiaht chief who was hanged with another man, Kitkinna, in 1869. The two were convicted for the murder of the captain of the John Bright and his wife, a schooner that crashed into the rocks by Hesquiaht Harbour in February of that year. By Hesquiaht accounts all of the ship’s 22 occupants perished after it hit a reef. But according to James Christenson, a European trader from another ship navigating the coast, at least two survivors from the wreck were murdered after they came ashore. When he visited Hesquiaht weeks after the shipwreck occurred, Christenson reported finding bodies of a man and a woman on shore above the high tide mark, with the man’s head missing. Acting as the coroner in May 1869, Dr. Peter Comrie inspected the bodies. By his account the people were not murdered but perished from the pounding surf with the rest of the crew, however an inquest into the incident from the HMS Sparrowhawk brought a different conclusion. Members of this ship determined that the pair were murdered, leading to the conviction of Anayitzachist and Katkinna in July 1869. At the time newspaper reports emphasized foul play on the part of the Nuu-chah-nulth men, but modern assessments of the historic convictions have taken a different view. Anayitzachist and Katkinna were on trial without legal representation, and Christenson, who was their accuser, acted as their interpreter in court. For Tim Paul, an exoneration of Anayitzachist would confirm what his family has known about their forefather for nearly 150 years. Richard Lucas, another descendent of Anayitzachist, said that the environment around Hesquiaht Harbour would have been hazardous for such a schooner. The men were given an unjust trial, according to the writings of Father Augustus Brabant, who established a mission in Hesquiaht five years after the shipwreck. He noted that consideration was not given to the common Nuu-chah-nulth practice of moving human remains to above the high water mark in order protect a tribe’s food source. According to Brabant, Katkinna could also have provided an alibi if he had an honest interpreter. “He was in Nootka when the wreck occurred,” wrote Brabant. After a quick deliberation the jury delivered their conviction to the two men in Victoria. The men were taken to Anayitzachist’s home in Homiss, northwest of Estevan Point, where they were hanged in front of family. Before his execution Anayitzachist delivered a chant proclaiming his innocence and foretelling the growth of his family. “’I’m innocent and from this day forward my family will flourish to prove my innocence,’ that’s a chant that our family still uses,” Paul described. This sacred chant was given in November 2012, when a gathering was held in Port Alberni to recognize the old wounds from the hangings at Homiss. As descendants of Anayitzachist, members of the Amos family attended this feast, as did Erik Kiaer, an ancestor of Capt. Henry Most of the HMS Sparrowhawk, whose crew conducted the inquest into the 1869 shipwreck. Also present was Ida Chong, B.C.’s minister of Aboriginal Relations and Reconciliation at the time. Although the provincial government stated that pardons and exonerations are the jurisdiction of the federal government, Chong noted regret for the historic conviction in what was then the Colony of British Columbia. “The province expresses its sincere regret and laments that Hesquiaht members – and family in particular – were forced to bear witness to such violence and for the trauma and pain they have endured,” said Chong. Lucas noted that while the feast was held in Maht Mahs, Anayitzachist’s prophecy continued to be evident. “That day there was a child born into the Amos family, and a week later another born into the Amos family,” he said. With their similar cases of historical convictions from rapidly advancing colonial governments, the Hesquiaht and Tsilhqot’in have shared in the recognition of their hanged chiefs. In 2008 Tsilhqot’in members attended the raising of a totem pole in Tofino, before the piece was transported to its final place in Homiss, Anayitzachist’s homeland. Commemorating the memory of the hanged Hesquiaht chief, that pole was designed by Tim Paul, who is a renowned carver. Tsilhqot’in members were also present at the 2012 feast in Port Alberni. In recognition of their shared experience, the Hesquiaht gave a totem pole to the First Nation, which was erected at Fish Lake in B.C.’s Nemiah Valley in 2014. This is the ancestral home of the Xeni Gwet’in band of the Tsilhqot’in people. In 2008 a pole commemorating the memory of Anayitzachist was raised, while Dwayne Amos awaited his place among Hesquiaht ha'wiih. Volunteers, including MLA Scott Fraser, raised the pole in Tofino before it was moved to its final location at Homiss.